Cornish Pirates forwards coach Alan Paver has said there will be no overnight success for his young side. 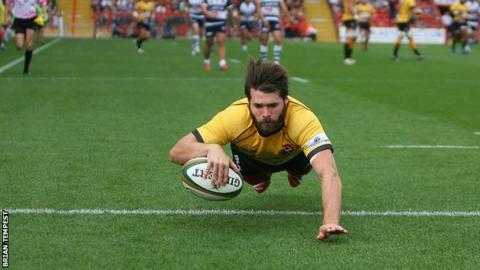 The Pirates were beaten 45-17 in Bristol leaving them bottom of the Championship table after three defeats. "It can sometimes be frustrating for players, coaches and supporters, but we understand it's a process that takes time," Paver told BBC Radio Cornwall. "We've gone for a different approach, local lads or boys who've just come in to senior rugby - it's a slow process." Paver continued: "A lot of our guys are at the beginning of their careers, the experience that they've had today is invaluable for our future. "Tyler Gendall was playing for St Ives last year and I said to him you won't be judged on the score or on mistakes. "I just want to see if you've got a bit of steel in your belly and see how you cope when you're under pressure and today I was very proud of him." Bristol had already secured the bonus point by half-time but the Pirates responded with second-half tries from Kieran Goss and Kyle Moyle to go with number eight Matt Bolwell's first-half effort. "I think we've played the three strongest sides apart from Worcester and when you go three games with no wins you want to put that right straight away. "If we can get to ball to some of these pacey boys' hands they are going to cause problems for the opposition and I would hope in the next few games we'll get more opportunities to play with the tempo that we saw in parts against Bristol."